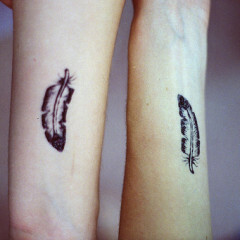 Whether it’s because of their design or shape, feather tattoos for girls tend to look really good on the ankle or foot. 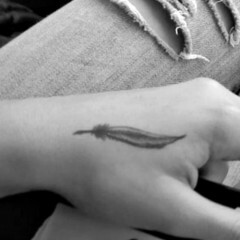 This girl’s feather tattoo is inked in black and white and features a partial band or bracelet on her ankle that holds two feathers extending onto the top and side of her foot. The feathers in the ankle tattoo are made up of very soft lines, which makes them look very delicate and feminine. 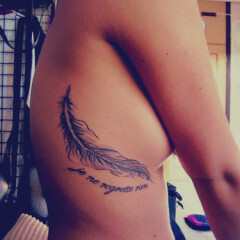 For one reason or another, this black and white feather tattoo appears to be inspired by a Native American heritage, possibly because it looks like the bottom part of a dreamcatcher. Feathers were considered sacred by Native Americans, and were commonly used in dreamcatchers hung above the beds of children to protect them from bad dreams and evil spirits.